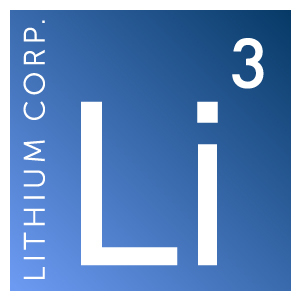 Las Vegas, NV – April 29, 2015 – Lithium Corporation [OTCQB – LTUM] “the Company” is pleased to announce that it has received all final sample results from its generative program conducted in Nevada and California during late winter 2015. Thirteen discrete basins were visited during this program, seven of which the company had little or no previous data. In all 104 sediment samples, and 46 brine samples were taken. Not all basins visited yielded brines, as the ground water table in several basins was lower than could be practically sampled utilizing hand tools. The sediment sampling portion of the program indicated that a previously sparsely sampled basin exhibits widespread lithium in clays. Twelve additional samples were taken here with lithium in clay ranging from 178 ppm to 503 ppm, with the average lithium content of these samples being 350.66 ppm Li. Brine samples returned values from less than detection limit (0.02 mg/L Li) all the way up to 341.8 mg/L which sample was taken in old evaporation trenches on a playa not previously sampled. On another playa 4 samples averaged 29.75 mg/L Li, with a low value of 15.18 mg/L, and a high of 69.7 mg/L. The Company intends to further evaluate these results, and determine whether there would be any merit in acquiring claims in these areas.